Pip: Chris! I have a brilliant idea for a new business. Chris: Who do we have to kill. Pip: No-one! That’s the beauty of it. It’s more about who we choose to kill. It’s a STRATEGIC business plan. Chris: Sounds great! I choose to variously kill/hire/build houses for a string of 19th century rural Frenchmen in the hopes of defeating you (and our friends) in the great game of capitalism. It’s a fine thing that this is what I have chosen to do, because it turns out that The Bloody Inn is a game about exactly this. Pip: That sounds like useful practice for my business venture. 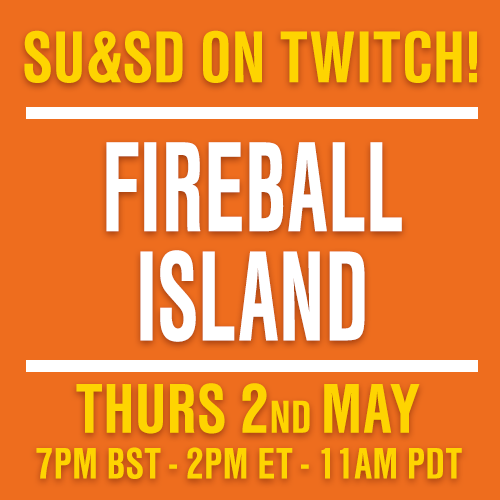 What do we need to do in The Bloody Inn? Chris: In The Bloody Inn we both set up shop as innkeepers in a remote village in France. Along with the other players, we each claim one room for ourselves while the others become neutral. A big stack of potential guests, represented by a deck of cards, sits at the entrance. We’ll take it in turns to populate the rooms of the inn with guests from the deck, taking lots of strategic considerations into account. There are clergymen, nobles, officers of the law, workmen, and most importantly my precious, precious newsboys. We each start the game with two peasants in our employ. Peasants are special because they are terribly poor, and this means that they sleep on the floor of the dining room when they’re not being used. No rooms for you, peasants! Each guest has a rank, from zero to three, which is used to determine the cost of doing stuff to them. ‘Stuff’ includes bribing them, in which case they are added to your hand as an accomplice, or killing them, in which case they become corpses in your possession. When a guest becomes an accomplice, there’s lots of things you can do. You use them towards the cost of other actions, such as bribing and killing and so on, and some of them are better at this than others. Many of them have an associated building, which you can ‘build’ to give yourself various bonuses. You also bury corpses under buildings, which allows you to both (a) evade the law and (b) take all of the money that was in the corpses pockets. 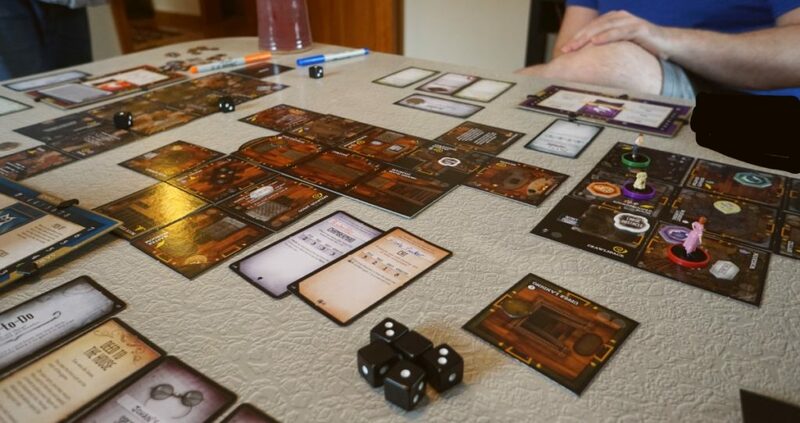 At the end of the round any surviving/unbribed guests leave, players collect rent based on anybody still in their rooms, and the next player welcomes a new host of travellers. 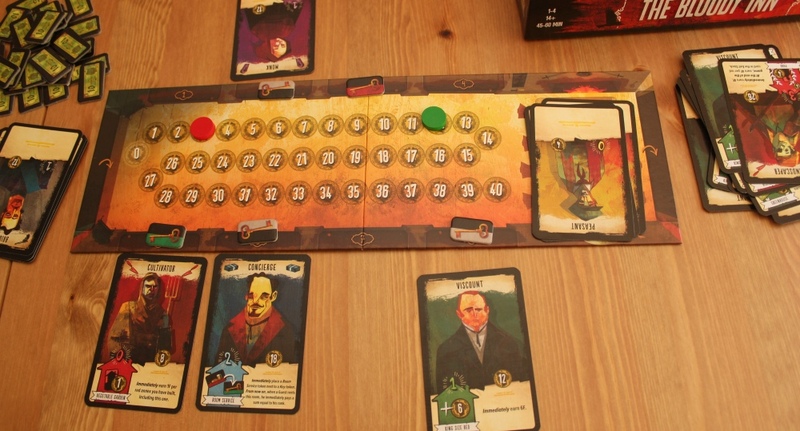 After two seasons of murderous innkeeping, the player with the most money wins. Phew! I think that covers it. But more importantly: what does the business of murder feel like? 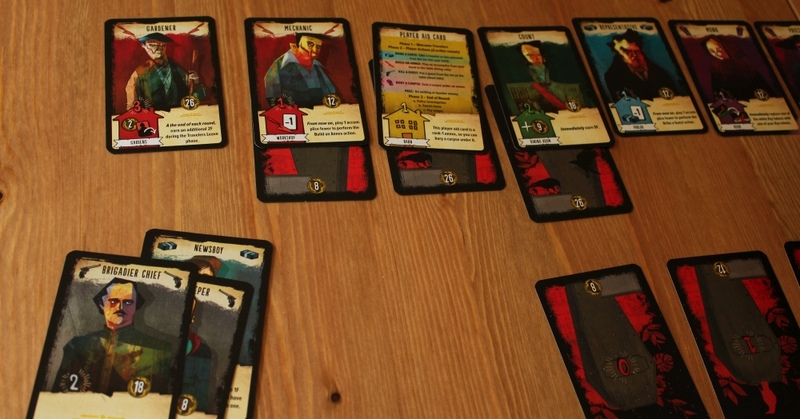 Pip: Mostly I’d say it feels like trying to build a well-optimised deck that lets you bribe the right accomplices, kill the right fools, build the right inn extensions and bury the right bodies as efficiently as possible. It’s about balancing your hand of cards which form your murder-staff against the cost of paying them each round. It’s also about risk management in that sometimes you’ll be unable to bury a body using the two actions you get to take a round so you leave it there on the table, hoping that a law enforcement card won’t show up and bring a police investigation to your doorstep. If that happens and you have a stray corpse or two lying around you have to enlist the local gravedigger’s help to get you out of your predicament and that is EXPENSIVE. There’s also the matter of your liquid assets. There’s a wealth track which goes up to 40 francs and that represents the cash you have available to hand. If you want to accumulate more wealth (and you definitely do) you’ll need to convert some of that into 10 franc cheques. If you start running out of money because you’ve hired a lot of people or mismanaged your murder engine then you need to spend actions converting those cheques back into points on the wealth track. In that way there’s a lot of balancing to be done which you get a feel for after you play a few times. You start to know what overstretching looks like and you learn which accomplices are more useful at different points of the game. I hate it when you get your wretched army of newsboys early, for example. 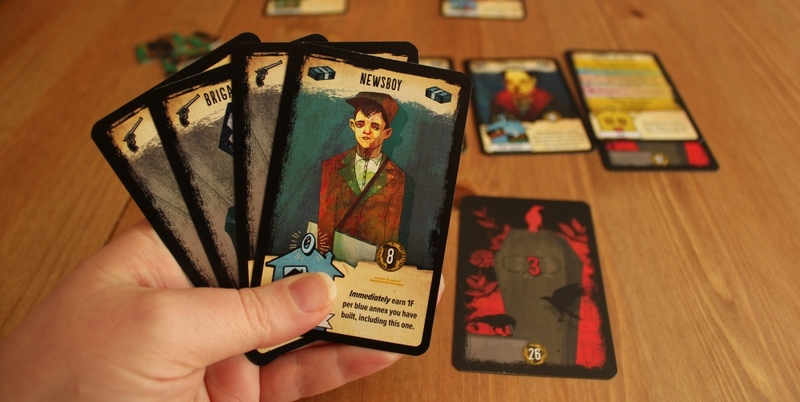 They have a rank of zero so that means you can’t bury anything under them if you use the card to make them into little newsboy buildings but they’re blue cards which mean you can use them to bribe other people into your company without losing that card. Two newsboys and you can bribe anyone except the super-elite rank three jerks. Chris: The faster I can get two lovely newsboys into my employ in The Bloody Inn, the happier I am. I like to imagine them scurrying around delivering morning papers, but they’re my morning papers and the headline is ‘WOULD YOU LIKE TO JOIN MY MURDER CONSPIRACY’. We played a game where I’d set up a beautiful conspiracy, but nobody visited to the inn who was much worth killing. You’d taken a gamble on an impulsive early killing spree, and the cash lead that granted you eventually shut me out of the game. 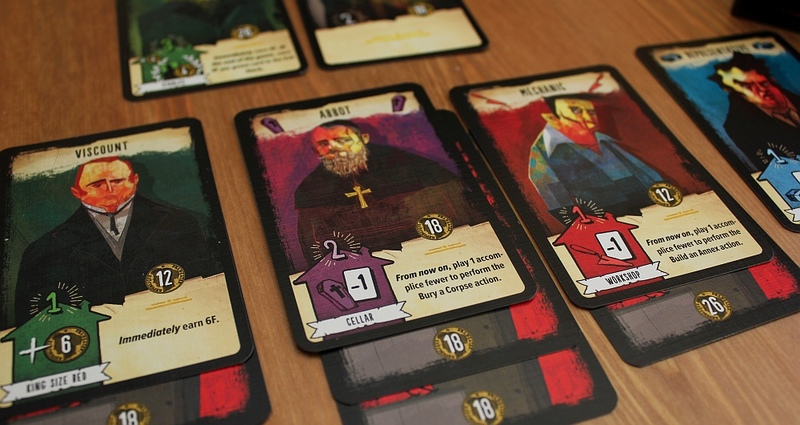 That’s what I like about The Bloody Inn, actually: unlike some deck building/set collecting/resource management games I’ve played, there’s quite a lot of strategic depth beyond ‘take the best thing on the board as fast as you can.’ The cards and numbers and resources amount to complicated territory that you can navigate in a surprising variety of ways. 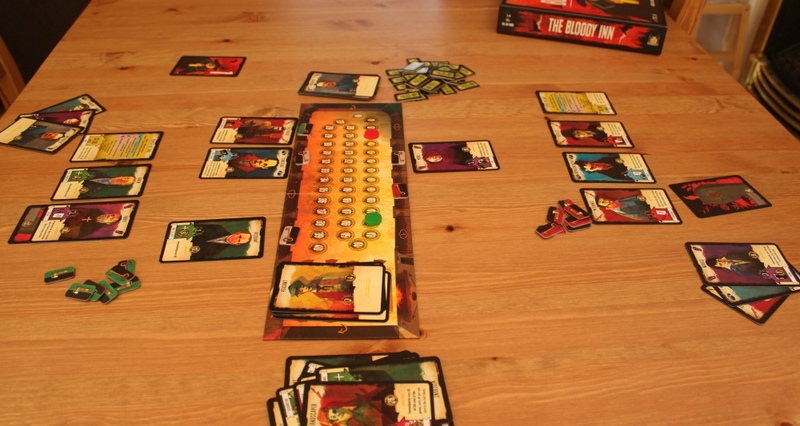 This becomes very apparent with three or four players (the maximum), where second-guessing each other’s competing plans makes every decision interesting. The fact that it’s a pretty open-handed game – you can’t really be taken by surprise by a card that your opponent is holding – helps with this. It doesn’t feel as random as some of its peers, and therefore you have to own your mistakes. Like when you were sat on all those valuable corpses when THE ENTIRE POLICE FORCE showed up for some kind of POLICE CONVENTION. Pip: If the deck had been more reasonable that plan would have worked out. Usually you only get one or two of the law enforcement cards in any one set of visitors so I had a system set up where I could be fairly sure at least one would be recruited by another player leaving me to kill the other one if there were two, or build an annex where I could bury him next turn. So many turning up unexpectedly meant that plan flew out of the window and, to be honest, I spent the rest of the game trying (and failing) to recover. Especially because on a later turn I needed a bunch of other resources to actually get me back into the game – maybe some cheap law enforcement cards to get the killing momentum going again, or a member of the clergy for body disposal or something and then suddenly and entire contingent of nobles showed up and the entire inn was all IT’S NOBCON NOW. Everyone who had been more conservative with their murder plans was suddenly able to take the literal rich pickings and I was left ruing the day. I far preferred the game where I got an early abbot and used him to build a cellar. That freed me up to just pootle about, building my resources, safe in the knowledge I could bury any later corpses with ease because the cellar decreased the burial costs by one. AND gave me two corpse spaces. Chris: I understand completely why you’d be excited about the idea of a well-timed abbot. It’s a game with a secret language and a lot of strange logic to internalise. This is a strength and a weakness: there’s real strategic depth here, but it can also take a little while to stick with new players. 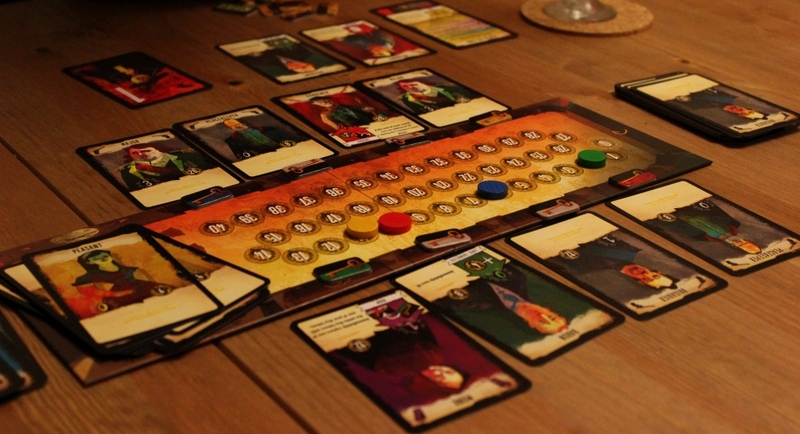 It’s not a pick-up-and-play game like Fungi, which we reviewed last time. Or at least, you become so much better with experience that The Bloody Inn can feel a little unbalanced when you’re introducing somebody to it. When we played with friends I found myself playing the first round not only open-handed but also explaining every decision I was making: it’s one thing to info-dump all of the rules, procedures and strategic concepts, but I found it more helpful to just say “I am taking this second newsboy in order to make future bribe actions more efficient, which perhaps you should also consider doing.” There’s a lot of stuff in here that isn’t particularly intuitive but is extremely important. This heady strategic layer also has consequences for the theme, but the fantastic art really does help in that regard. With a little imaginative investment, you can spin a narrative out of some of the decisions you’re forced to make. For example: the police showed up, so I had to commit one of my newsboys to hurriedly burying a corpse, after which I dismissed him from my service, while the other helped to kill the brigadier himself who I then buried underneath the workshed. This is much better than ‘I spent two blue things to move a green thing and a grey thing’, and that’s thanks to the presentation. Pip: The thing that seemed hardest to grasp by people we introduced the game to was the idea of converting person into a building. When you get used to them the cards manage to express a lot of information in a very economical way, but there’s bit of a comprehension hump on the way to that point. 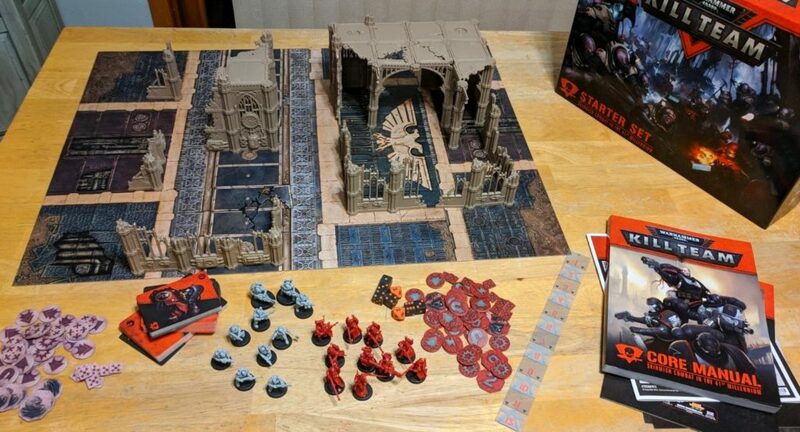 I do really enjoy playing it, but that experience teaching it to friends makes me think it’s not the sort of thing where you can just bring it out and expect people to get it immediately. I think you likened it to videogames and that’s a useful comparison – where you’re a person who knows the rhythms of that particular game and the timings where an item is optimal to pick up or how particular abilities chain together. The newcomers are kind of floundering at first, trying to get their eye in and if you’re not all floundering together you could so easily just trounce them. There’s not the same pick up and play-ness of some other card games this site’s recommended recently, like Archaeology or Condottiere. I do really like it. I’ve even been sneaking in plays of the single player inn-management, trying to best my own score. 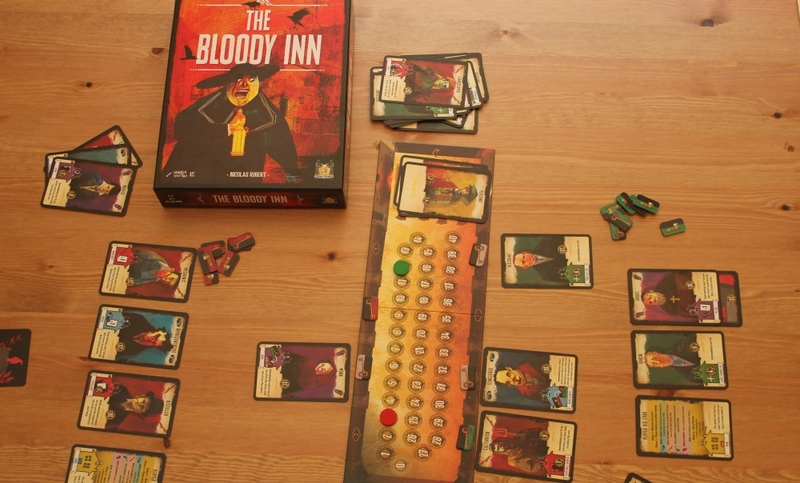 I think anyone who fancies a tactical killing spree should feel confident in buying The Bloody Inn, but like a real murder conspiracy, just think twice before revealing it to your friends. Chris: Very good point. It’s worth remembering that history’s great murder-theft businesses (Sweeney Todd’s barbershop, the Thénardiers in Les Miserables) were equal-opportunities affairs. Pip: You’re listening to Les Mis aren’t you? Pip: I can literally hear it through the walls.